Yesterday, we had a fun training day for our Moda Sales Reps at our Dallas office. 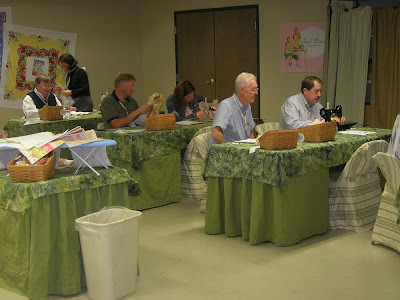 They attended four different classes... Sewing, Notion demos, and two Technical classes. 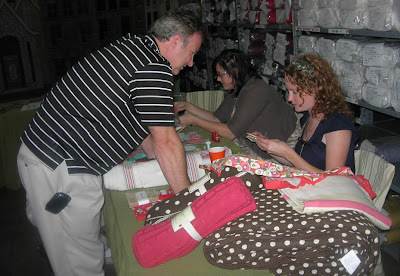 Even our Sales Reps must know how to sew! All the Sales Reps made little bags made from Honey Buns. 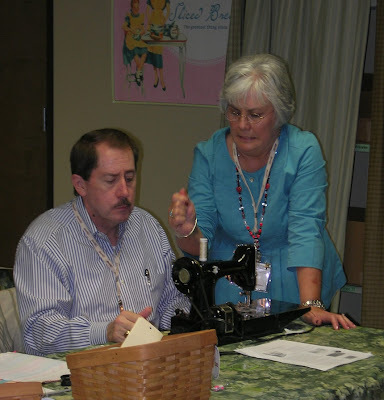 Debbie Duckworth (Customer Service) helping Joseph Galza (Sales Rep) with the Sewing Machine. Kind of looks like she is getting a little frustrated with the machine... doesn't it? No, really, she was great teaching them how to make their Bags. All you Wisconsin and Illinois Moda Customers out there... Check your Sales Rep, Stephanie! 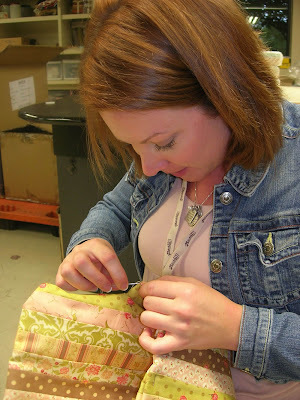 This is her very first time hand stitching (whip stitching). Go Stephanie!!! 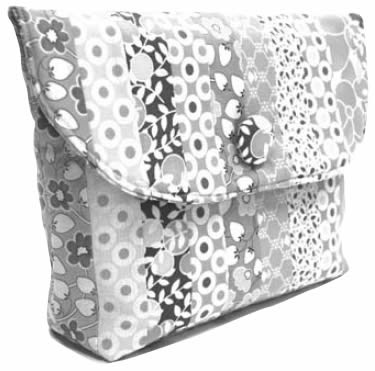 You can get a Free Pattern for this cute little bag off our Moda website. 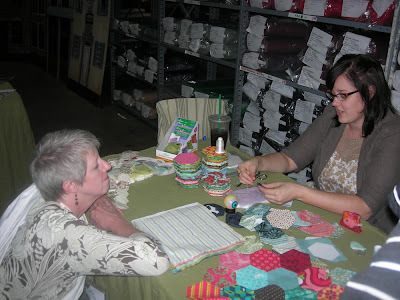 Sales Rep, Jane Stewart watching demo from Jen, you may her as Tula Pink. Sales Rep, Jon Taylor watching demo from Allison, one of the Urban Chiks. We had a lot of fun yesterday. 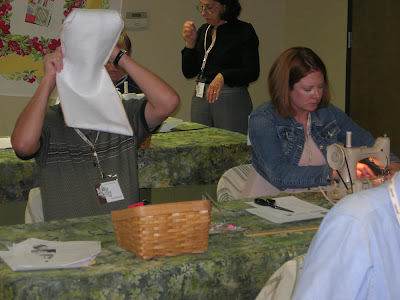 Now, tomorrow we will be off to Quilt Market. Have I mentioned how lucky you are!?!?! I LOVE this entry!!! What great pictures. I might have to have the Debbie and Joe picture for my screen saver. May I recommend my sister Polly for the next sewing lesson. You guys are busy! What a fun post! That picture of Debbie cracks me up. Hope you are having fun at Market! Thanks for all the photos...I see you had photos of the Moda Sales Rep class. I have emailed Moda regarding sales rep positions or any other positions available, but have a hard time finding the right person to speak with. Is it possible that you could send me in the right directioN? Thanks so much!